Martin Walker at The Poisoned Pen! Every time I see that Martin Walker is going to be in town, I know I'll be heading to my favorite bookstore, The Poisoned Pen, and it makes me happy that Walker usually appears on a day when Denis can come with me. 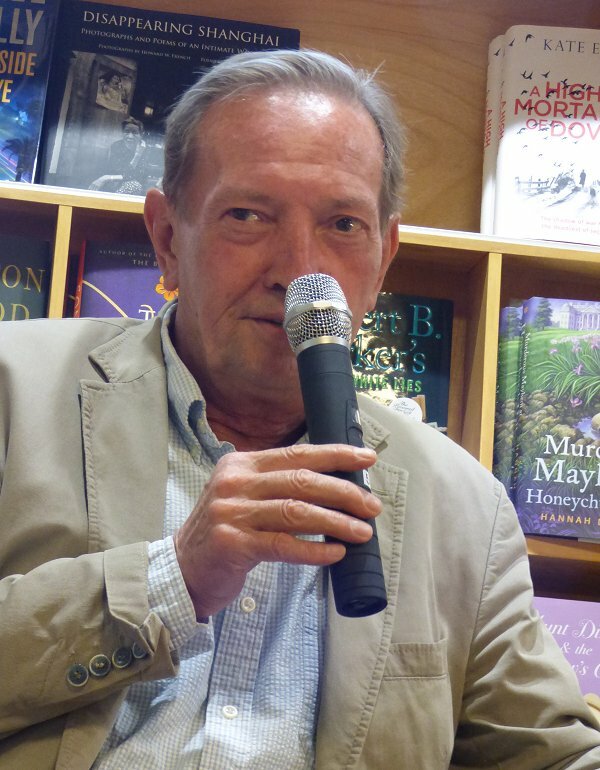 The number of people attending his events grows larger every year, and a good percentage of those who come speak French and have visited the area in France about which the author writes so lovingly. Speaking of crowds, I was thrilled when so many people came to see Walker that The Poisoned Pen staff had to bring out a lot more chairs. 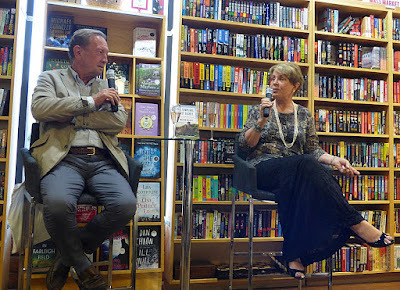 The conversation between Martin Walker and the grande dame of The Poisoned Pen, Barbara Peters, began slowly with talk about traitors and Communism-- referring to the recent appearance of Joseph Kanon and his book Defectors. "I heard it said once that being a traitor is often a matter of bad timing," Walker said, which is true and ties in quite well with Napoleon's saying that "history is written by the winners." After saying that Communism was thought to be just the thing to bring the world out of the Great Depression, the two then talked a bit about Walker's travels. Barbara knows Walker's wife, Julia, and would love to have her come to one of Martin's appearances at the bookstore. "My wife doesn't come on tour with me unless we're in a town for at least three days," Walker said. Pointing to his seersucker shirt he added, "Being on tour isn't all that glamorous. I wash these shirts out by hand and have to have them hanging out to dry in my hotel bathroom. I think Julia is afraid she'd be expected to take over laundry duty." 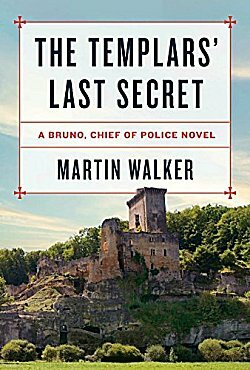 Talk then turned to Walker's latest Bruno Chief of Police mystery, The Templars' Last Secret-- especially Amélie, a Haitian woman sent down by the Ministry of Justice to see how Bruno's doing. Bruno is absolutely appalled that this woman is going to be following him around for two to three weeks. Amélie not only is a jazz singer, she's extraordinary when it comes to social media, which-- as Walker says-- "proves to be very useful in solving the crime." "Yes," Barbara said, "she whips out her phone instead of a gun..."
"...and advances the plot!" Walker added. The two then talked a bit about how crimes are investigated in France, with the gendarmerie, the Police Nationale, the Ministry of War, the Ministry of the Interior, etc. I'm going to leave this part out, but never fear! This event is on Livestream, so you can listen to every word! Bruno is usually dealing with people he knows when he's solving crimes, and this gives him a tremendous advantage. In fact, the UK and New York City are talking about bringing back "beat cops"-- police who patrol a particular neighborhood day after day. Bruno and Amélie get off to a rocky start, but once he finds out that she's a singer, things begin to change. Then he learns that she has another point in her favor: she loves food. In St. Denis, loving food equals acceptance. "She becomes part of the community by eating," Barbara remarked. "My books usually begin with a certain image," Walker said. "This book began with a ruined castle that stands on a high cliff. The body of a woman with no ID is found at the foot of the cliff below the castle. Amélie and her phone become very useful in identifying the dead woman. "The land for the castle was given to the man by Charlemagne. When the castle owner went on Crusade, he entrusted the care of his castle to the Knights Templar, and it is rumored that the Templars' treasure is in the caves below the castle. How could I not use this in my book?" Walker asked us. Quite an interesting discussion of cave art followed, with Walker telling us that the artists just happened to come across the perfect illumination so they could see to create those wonderful drawings: a stone bowl, rendered reindeer fat, and a juniper twig wick. This creates a clear, bright flame with no smoke. I'm not a drinker, but Martin's recipe for walnut wine intrigued me so much that I wouldn't mind tasting it. Want the recipe? Go to Livestream! Then followed something that put a huge smile on my face. 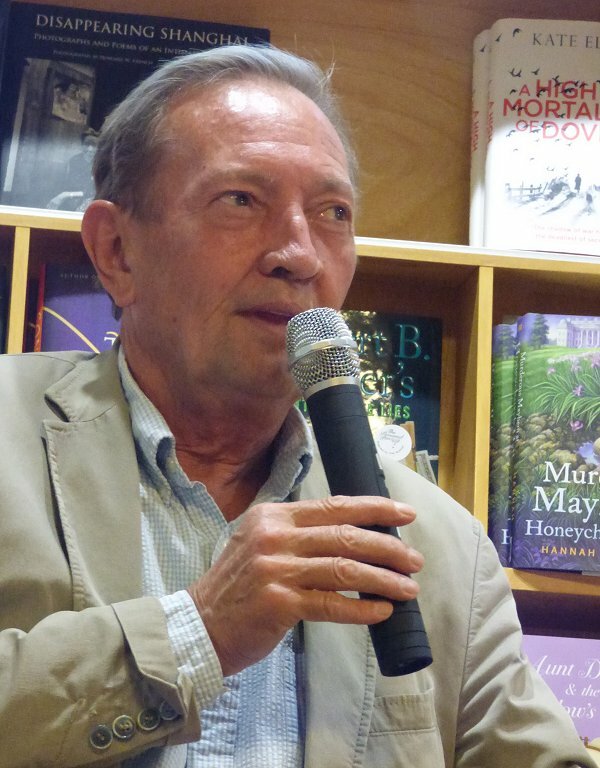 Barbara told us, "Martin lives in an area of France with a long history of disliking and distrusting the English, yet now he is almost the personification of the area!" This is when I began to smile. "I think it helps that I'm Scottish!" Walker replied to laughter throughout the bookstore. Not everyone understands that there continues to be a distinction between being British and being Scottish. Evidently Barbara is one of them-- or just thinks the whole thing is silly. Silly or no, when your country has been forcibly absorbed into another, chances are you're going to be a bit stubborn about being described by the conqueror's nationality. It's going to be a long, long time before the inhabitants of this planet see us all as One World. Talk really began to jump from topic to topic. There's no good news about an English version of the award-winning Bruno cookbook or about being able to bring Bruno's own wine to the U.S.
Bruno's basset hounds were discussed, and Barbara let it be known that she wanted to know more about the mayor of St. Denis who's been rather quiet in the last couple of books. "I've known three mayors, and they're all convinced they're the model for the mayor of St. Denis!" Walker said. 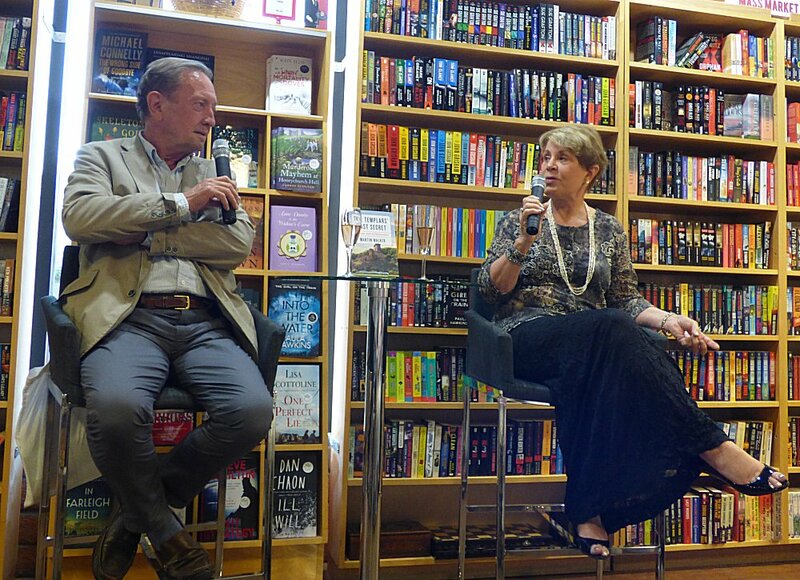 We all applauded when Walker said that he'd finished writing the next Bruno mystery. It begins in a cookery school where Bruno is supposed to be advising everyone on how to get five meals from a duck. Walker rattled five meals off and then told us why it was so easy to do. "Julia kept a log, and we consumed forty-two ducks one summer. It's a wonder we didn't get webbed hands and feet!" After a few questions from the audience, talk then turned to current European politics. 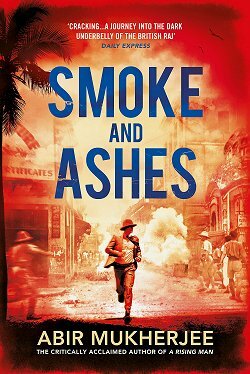 Walker is an award-winning journalist who's traveled the world. He's a member of a think tank. There are so many things that he's done (or continues to do) that he's a fascinating speaker on countless subjects. For those of you who take advantage of The Poisoned Pen's Livestream feed for this event, the camera and microphone were turned off for the political segment that ended the evening. Oh, lucky you, Cathy!!! I really like Walker's series, and it would have been great to see him in person. Looking forward to Bruno's next adventure, too! Sounds like a very good evening. I'd have liked to hear about the political segment, but since it wasn't videoed, I guess not. I have to get into this series somehow. 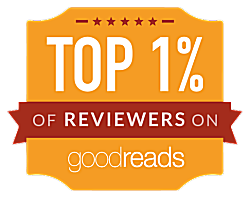 It sounds like another one that can reel in and hook readers. I am someone who absolutely understands the distinction between being Scottish or English. I get it. Half of my family is from the Republic of Ireland. I know enough of the history of the independence movement to cherish my Irish heritage. And I know enough about Scotland now to understand the importance of a separate identity. How have I learned this? Books by Scottish writers, including Peter May, especially Entry Island, but also the Lewis Trilogy. And then googling about Scottish history. Also, blogs here about trips to Scotland and also Peggy Ann's trips there, too, have taught me even more. Yes, the Irish would most certainly understand! Yes! And I think many of the Welsh understand, too. I knew a woman from Wales years ago who told of people being put into stocks for speaking their own language. She would not use the term "Britain," but said "England, Scotland, Wales, Northern Ireland." Kept her country's identity separate. You've probably noticed that I do the same thing. I don't use "Britain" or "British" very often. 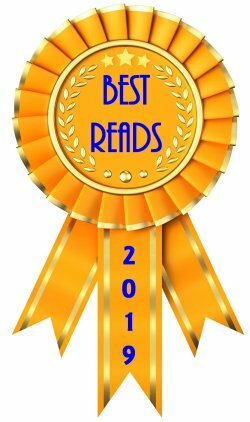 Do you have suggestions on the best Bruno books? 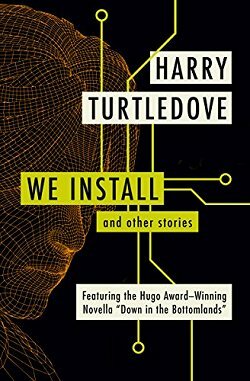 I ordered the first one at the library but it was dusty and I couldn't read it. So maybe more recent books would be more dust-free. Perhaps, but that very first book is the one that will pull you in hook, line, and sinker. It is the all-important foundation of the entire series. I may have to get a Kindle so I can read these books without dust or cigarette smoke odor, dirt, etc. And glad to see you don't use Britain often. My friends and I who work on a newspaper sometimes never say U.K. and rarely use Britain, but prefer to use the different countries' names. But as someone with Irish heritage, I don't say Northern Ireland either, but the north of Ireland. That is common, too.